The licensing costs of SCADA systems can be very expensive, and a big reason for that is because many systems design their fee structure around data tags. A tag is a single data point brought into the SCADA system for monitoring or control. The more tags you have, the more you pay, and the costs can easily balloon. 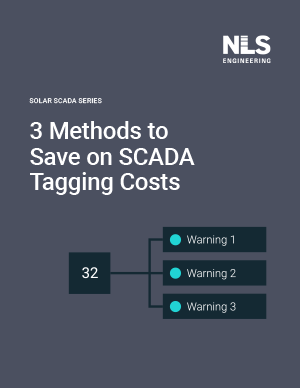 Here we’ll show you 3 methods to optimize your data tags to reduce your overall SCADA system costs and set things up in a much more efficient and organized manner. The most cost efficient (and seemingly obvious) solution is to select only the tags you need, manually. Allocate some time for a good SCADA integrator and a couple of your engineers to sit down with the available data points and decide which ones add value. ‍Is monitoring this information critical for the safe and reliable operation of the equipment? Does it give insight into the system in such a way can could save money or time? Will it help the plant operate more efficiently? Is the data point needed for regulatory reasons? Is this information redundant? Is it useful at all? The best part about a PV Solar plant is that it’s made up of a handful of unique devices, repeated. For each unique device, you only need to take the time to scrutinize it once. The rest of the devices can follow along with a virtual copy and paste. Where, exactly, along the communications pathway you get charged for a tag is completely dependent on SCADA software. It’s a great idea to find out where that paywall is, and bring all your “maybe” points up to that point. This affords you the flexibility to err on the side of caution, commission the “maybes” at 90% and be sure they will work from that point without having to subscribe to their licensing fees. If you find out you did need them after all, you know they work from that point, thanks to a thorough Site Acceptance Testing at commissioning. Some devices come with a bit-packable configuration. Manufacturers configure data points so many digital statuses can be communicated at once using a single integer. 16 times. That’s a lot of chatter; a lot of tags to be charged for. This method has the potential to cut back on a lot of tagging, but it doesn’t always pan out. Not all manufacturers design their points for packing. Some devices don’t have an address from which to request multiple alarms. The easiest way to cut back on licensing fees is to choose a prudent configuration now, instead of letting expenses accumulate over the lifespan of the facility. This applies to any facility, but it’s especially beneficial for PV Solar plants with their repetitive nature. Scrutinize your options, pick wisely, and park the ‘maybes’ outside the paywall. Explore the capabilities of your devices and collaborate with an experienced SCADA integrator to take advantage of your options in advance.